Starting on Friday, January 23, at 6 p.m. will be the market hog weigh-in, but beginning on Saturday this weeklong county fair will have events happening every day! There is something for everyone to do! Whether you are coming to buy a market hog or a steer; walk around the W.H. Stuart Conference Center in Bartow to check out the different exhibits that range from cakes, jams, photography, home decor, table-setting, storytelling, and more; or if you’re coming to see the whip popping contest, the attractions going on during the fair are endless! For anyone traveling through Bartow during the week of January 24-30, make sure you take the time to stop in and experience the fair for yourself! Trust me, it’s something you don’t want to miss! Check out some of the events listed below and plan a day to come! Please note: Some of these times will be pushed back due to ongoing events. 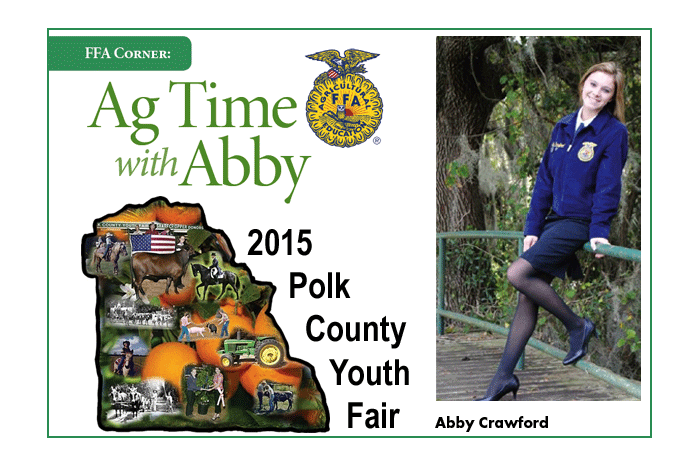 ABOUT THE AUTHOR: Abby is the president of the Haines City High School FFA chapter as well as the voice behind 97 Country’s segment, “Ag Time with Abby,” which airs the first Friday of every month during the “Breakfast Club with Roger and Melissa.” Abby is also the 2014 Polk County Farm Bureau Youth Speech Contest Winner. For questions, FFA news, or FFA story ideas, email Abby at abbigailreis@gmail.com.